Being that Christmas only comes once a year, it’s easy to forget about the invaluable works of seasonal art and the lessons we can take from them the other 364 days on the calendar. I admit my Christmas spirit has an expiration date of about a week, but there are a few gems that somehow avoid the staleness of repeat viewings/readings/listenings, so much so that I actually grow to appreciate them more with each passing year. The film A Christmas Story is one example, in my case. Now that the movie has earned a permanent status on TBS with its 24-hour marathon each Christmas Day, it’s hard to actually avoid seeing A Christmas Story every year. In my house, the tradition is to start the DVD on endless replay several weeks before Christmas, so it’s more of a constant parade of nostalgia and humor leading up to the big day. Strangely, it serves as a sort of comfort instead of an annoyance; this is the only film that can boast an immunity to being overplayed year-round. So where did this tolerance come from? A Christmas Story is, of course, playing in the same room with me as I type this. And I wasn’t thinking of this blog post before the movie started up today; it occurred to me just about ten minutes into this viewing that every single scene in this movie is quotable. Every single scene. Go ahead. I challenge you to watch this movie and not find a hilarious, poignant, or witty quip worthy of repeating in each scene. How many movies can boast that? I’m a bit of a movie buff and even with my generous amount of knowledge of cinema, I can’t think of another movie like this right off the top of my head. So many films have a sluggish section, an empty part or two with the sole purpose of bridging to the next important scene; even my favorite films have parts that I probably wouldn’t miss if they’d been edited out. 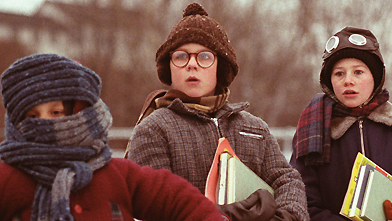 What A Christmas Story has acheived is a story as tight as a drum, without any unneccessary fat, and is the ultimate example of a stream-lined experience for audiences to relish time and time again. Every single scene needs to be there, and adds to the enjoyment of the movie while keeping the action moving forward. How much better would movies and books be if they left out all of the extras and made every single scene count? I know this idea is an obvious one, but with movies bloating into the 3+ hour realm, and books swelling past reasonable attention spans, it’s clear everyone is not following this basic rule of thumb. I wondered what would happen with my own stories if I looked back and applied the Christmas Story rule to them. Would they stand up to the test? Though it’s a nearly impossible task to be as quotable as Jean Shepherd, it doesn’t have to be about catchy phrases or memorable lines. A startling idea, a unique description, or a vivid gesture are examples of ways to make a scene pop. It’s something for writers to keep in mind when a scene just isn’t working out. Sometimes, we know we have to have a scene between two key parts of the story, but figuring out what happens in that hole is a struggle. What if we could start with that hook, the memorable quote, the gesture, the wonderful description, and work on the rest of the scene from there? It may just be the puzzle piece that tells us the rest of the story. “My little brother had not eaten voluntarily in over three years.” – Ralphie’s narration. “Fra-gee-lay. That must be Italian.” – Ralphie’s father, upon reading the word FRAGILE on the side of a crate. “You’ll shoot your eye out, kid.” – Santa Claus at the mall. “You used up all the glue on purpose!” – Ralphie’s father, after his mother broke the leg lamp. “We plunged into the cornucopia quivering with desire and the ecstasy of unbridled avarice.” – Ralphie’s narration, on tearing open the presents on Christmas morning. “In the heat of battle my father wove a tapestry of obscenities that as far as we know is still hanging in space over Lake Michigan.” – Ralphie narrating about his dad.